Happy Valentine's Day! Are you on excitement overload for this new My Creative Time release? There are so many fun new goodies to play with! Today we are sneaking the new Treat Slider Box! Look how cute and fun this box is! It's the perfect size for four Hershey's Nuggets, but really anything can be tucked into it! There are four dies included: the bottom and top of the box, along with two different Nugget covers that can be used together or on their own. For my box, I used some red cardstock for the base and a striped patterned paper from Carta Bella's Devoted 6x6 pack for the top. I also used the new MCT Stitched Doily Die to decorate it. Since the doily was a little too wide, I cut out a strip from the middle, pushed the two parts together, and covered the "seam" with some ribbon. I used a heart from MCT's Stitched Layering Heart Dies to cover the point where the two ends of the ribbon meet, and on top of that I put a little button made with the new MCT Stitched Button Dies. I tied the button with a little bit of Thin Hemp from Liz's Paper Loft Boutique. For the Nuggets, I covered two with just the rectangular strip (you can see one in the box), and I added the scalloped strip on top of the other two. So pretty! I couldn't stop at just one box, so I made this one for the aide who works in my classroom. I used hot pink for the base and cute patterned paper from Echo Park's Love Story for the top. To decorate this one, I wound some black Thin Hemp around the box, attaching a couple of "charms" and a tag made with the new MCT Chunky Jar Accessories. I made the crown using some silver paper from The Paper Company, layering it on a piece of black cardstock to give it extra stability. 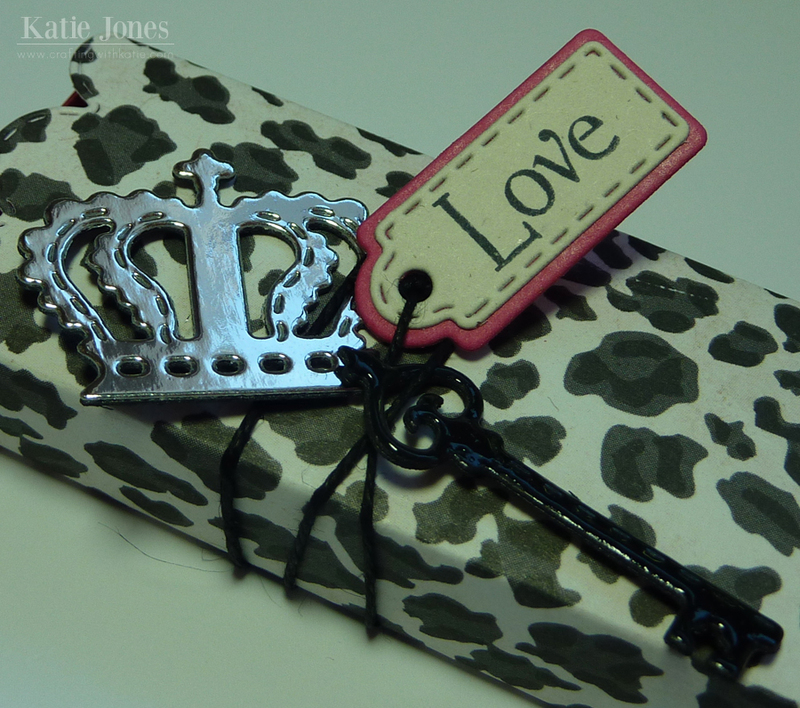 The key was made with two layers of black cardstock and Glossy Accents on top. I love the realistic look it gives! I also added a little heart from the Stitched Heart Layering Dies, which I stamped with a background from MCT's Build a Banner Kit, using Versamark Ink. Since the Treat Slider Box is a larger die, this will ALWAYS be a "PRE-ORDER" item. Please allow a 2 week turn around for delivery of this die. ALSO, this will be sold individually and will NOT be included with the bundle! Happy Valentine's Day! I see you have used lots of dies! Can't wait to get then! Thanks for sharing! Your projects are so pretty! Oh Katie how gorgeous is your slider treat box and your idea with the doily is genius you sure did you a lot of dies and you came up with one spectacular creation. Love it!! Happy Valentine's Day, Katie. Awesome showcase of the new release! Thank you for sharing. Looking forward to the full reveal tomorrow. Your boxes would be such a wonderful gift! Happy Valentine's Day! Can't wait to see the new release in its entirety tomorrow. 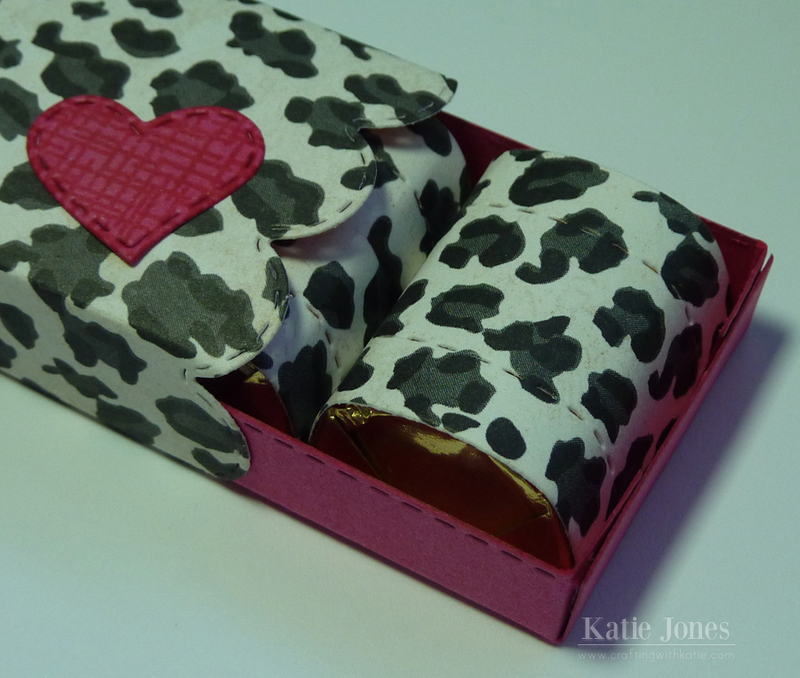 Katie, I'm so in love with these treat slider boxes!! Great job! Great job! LOVE the crown charm! OMGosh I'm so in love with your boxes! They are so adorable! Perfect for a little treat!! This release is so awesome I almost can't stand it! lol Happy Valentine's! Love the matching candies! Saw it earlier on facebook! Great work! Oh, so cute!! Perfect treats for Valentine's Day. Your boxes look fabulous. You always have such great creations. Your treat slider boxes are so cute. I like the striped paper colors with the red box - very nice! I love how you did both boxes...so different. Your crown and key are great...the 2x layers and glossy on the keys does make it look like a real metal key. Great job. The Zebra print is just great. Really give this box that something special. Great idea. Very cut projects. OMG!! I love those dies and your treat boxes are gorgeous, thanks for sharing. I Love these, they are Fabulous. Love those little treat wraps for the candies. Beautiful! these are beautiful!! 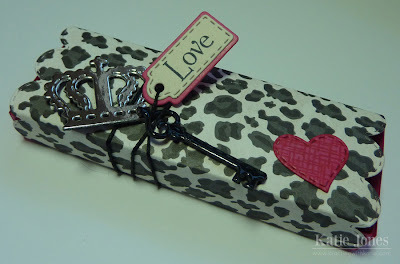 love love love the pattern papers you used! and the cut outs are great! can't wait to place my order tomorrow! thanks for sharing!! Beautiful! LOVE the doily on there!!! Everyone loves the treat box! So adorable. This die is so versatile and I love the papers you used to created your boxes. This is a must have (that must have been the 5th or 6th time I've said that this week...I love all the releases this month). 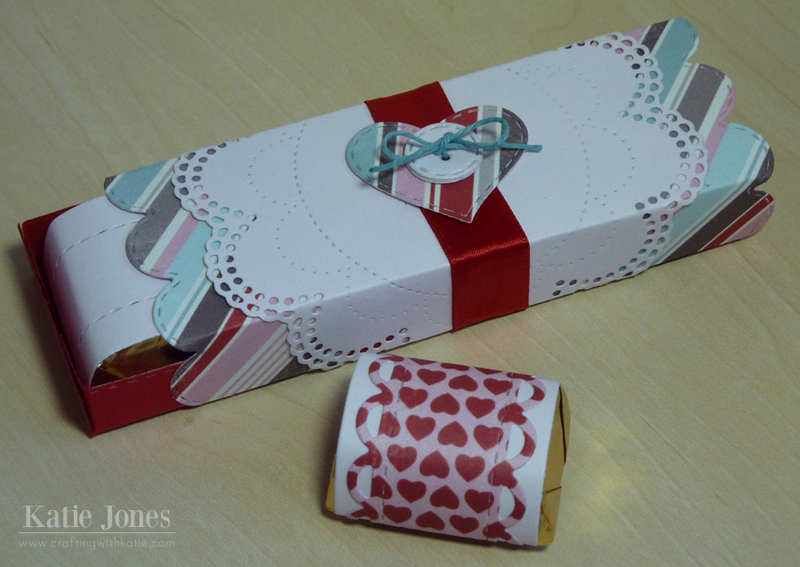 Great treat boxes--I like how you used the doily die on the first one. Great project! Release looks so fun, I can't wait for tomorrow! Such a FUN new release!! Your treat boxes are super fun. I'm in love with this release. The animal print is soooo fun! Great job with both of them! This treat holder is soooo AWESOME!! 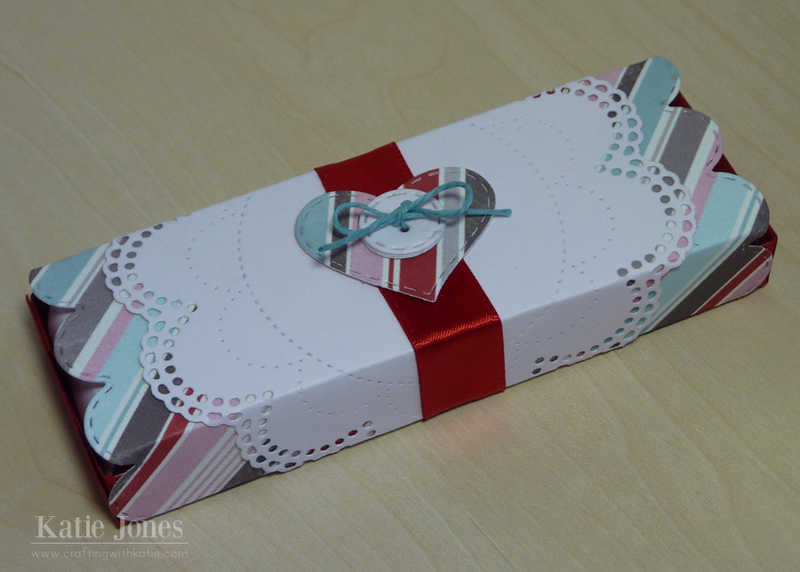 I love, love the doily die, the slider box is awesome, just a great project! TFS! Love your treat boxes. This is an awesome release. Cute! Cute! Cute! I can't wait to get this die!!! Oh golly, simple and very cute candy holders. Just love how you used the doily on your treat box....along with the heart and button....so cute. Hope your Valentine's Day was special! Yes Katie, excitement overload... your boxes can out so pretty, this is a great die! You showcase everything beautifully as always! too too cute!! I love it! 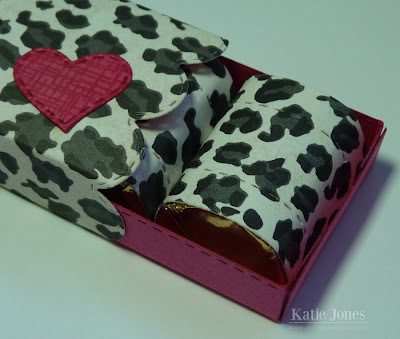 Katie ~ both you Slider boxes are FABULOUS!! Of course I LVOE the papers but that animal print one ~ OMG ~ I need to make this one for my niece!! I never thought about that until I saw yours ! EEEK! Awesome job as always! Thanks for all the details! I love your tips.